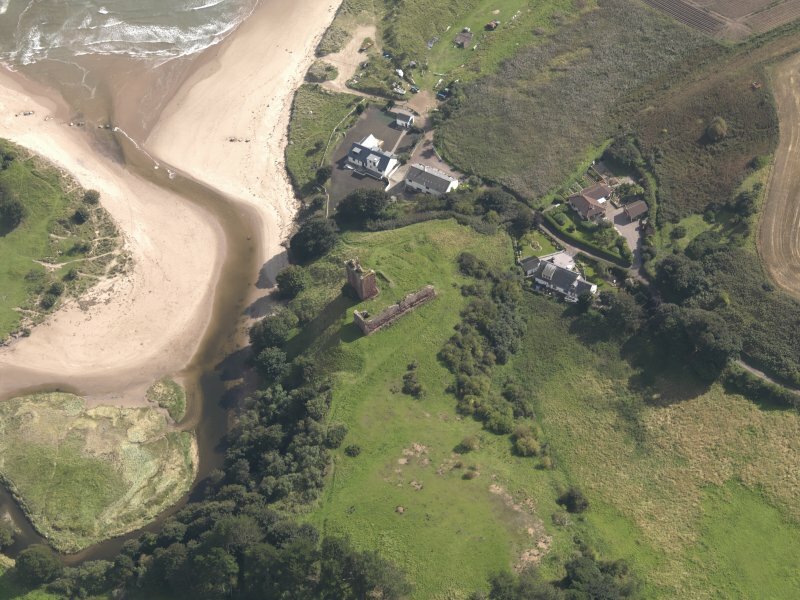 General view of Red Castle, Montrose. 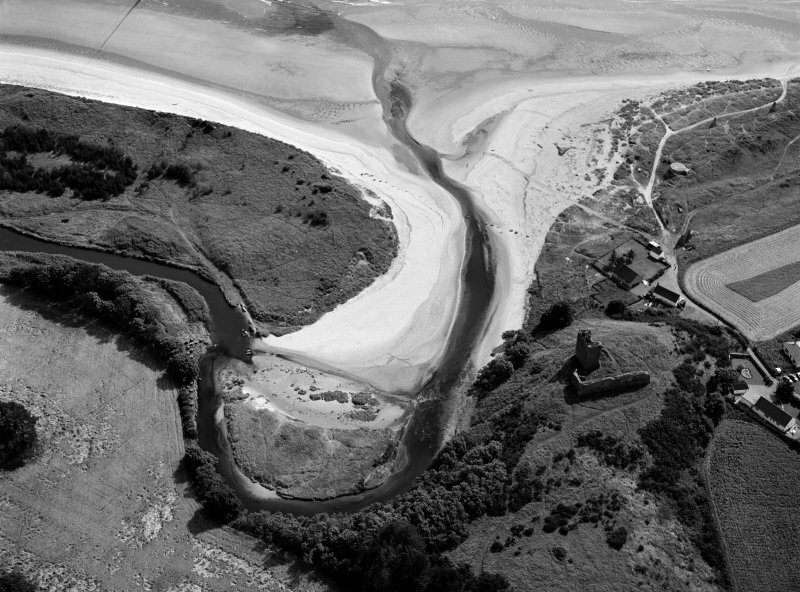 Oblique aerial view of Red Castle, taken from the W.
Oblique aerial view of Red Castle, taken from the SSW. 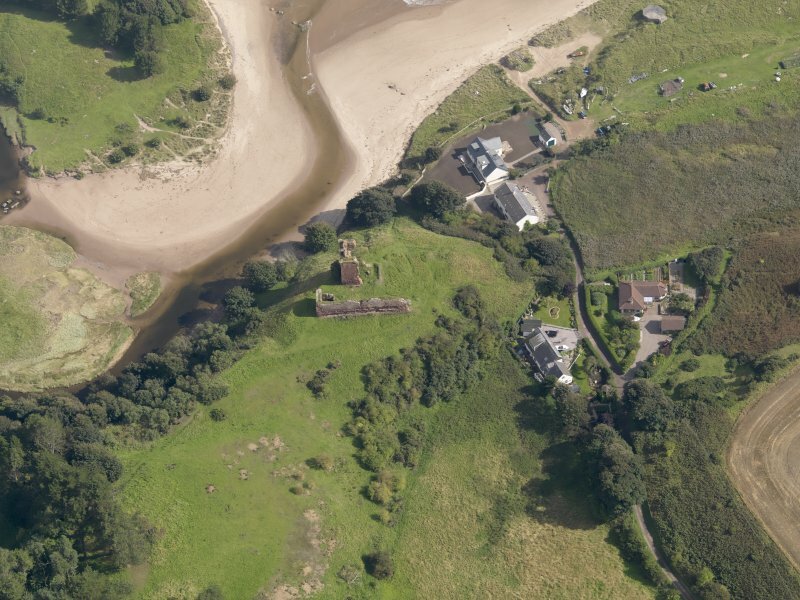 Oblique aerial view of Red Castle, taken from the WSW. 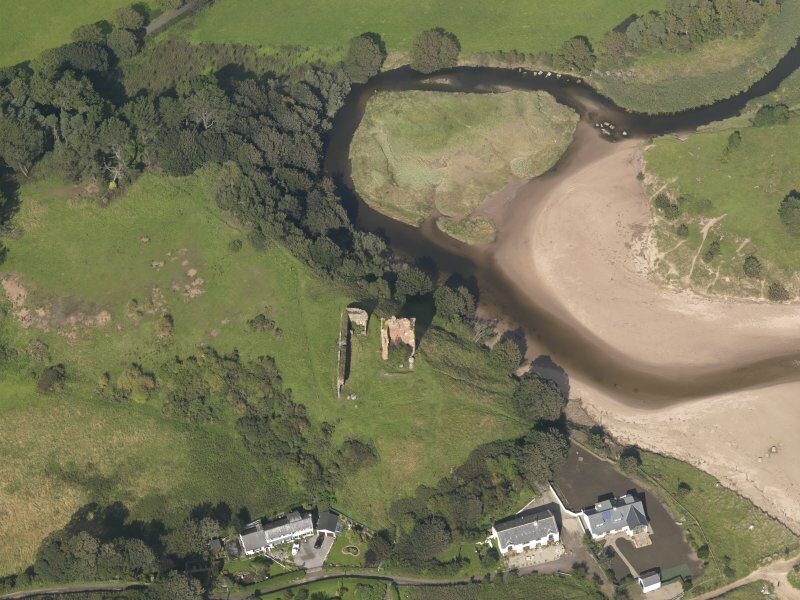 Oblique aerial view centred on the remains of Red Castle and Lunan Bay, looking to the ENE. 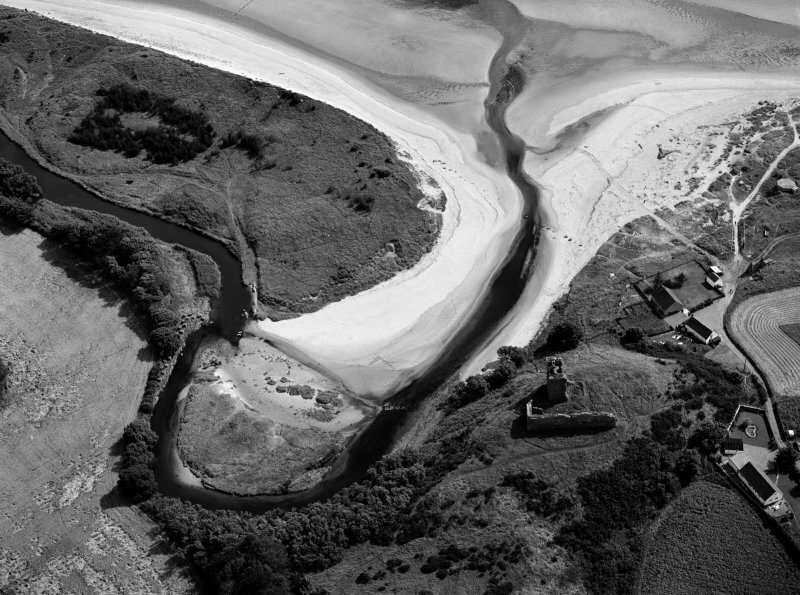 Oblique aerial view centred on the remains of Red Castle and Lunan Bay, looking to the ESE. 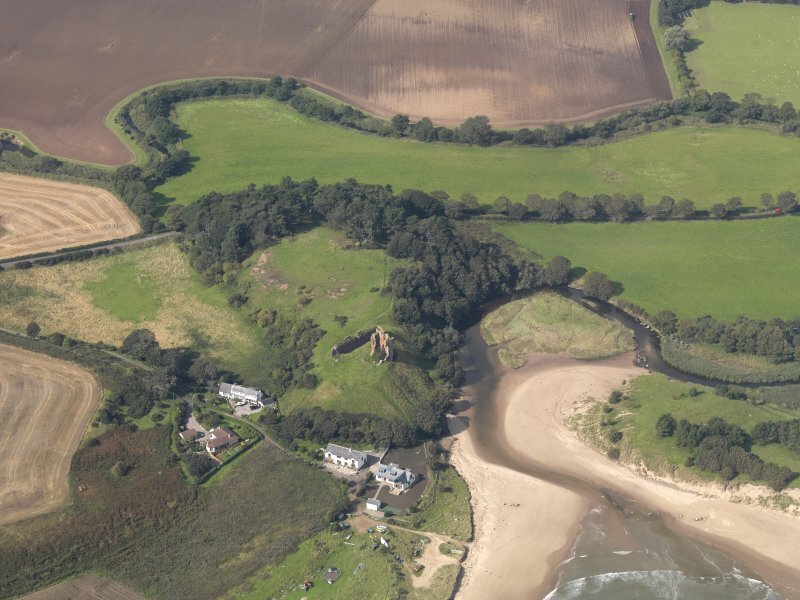 Oblique aerial view of Red Castle, taken from the S.
Red Castle, oblique aerial view, taken from the ESE, centred on the remains of Red Castle. 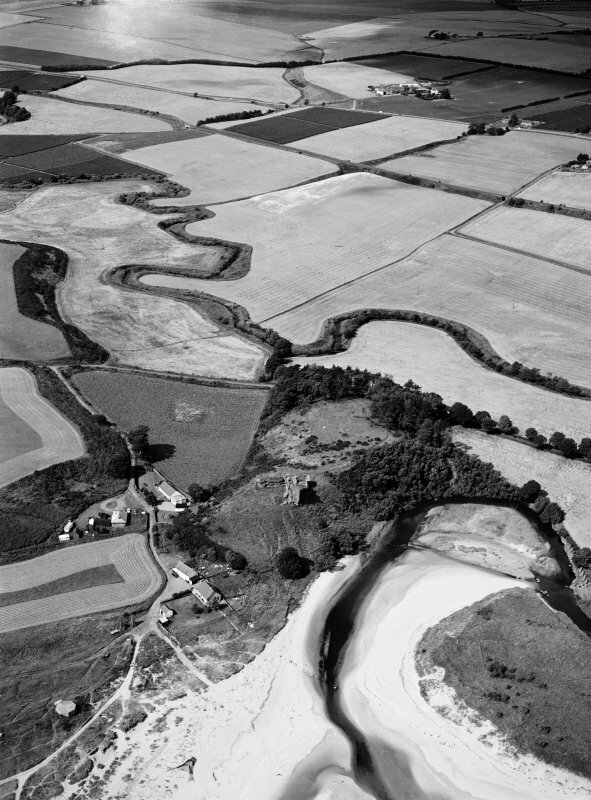 The cropmarks of an unenclosed settlement and a barrow cemetery are visible in the top left-hand corner of the photograph, and a pillbox and anti-tank blocks are shown in the bottom left- and right-hand corner. 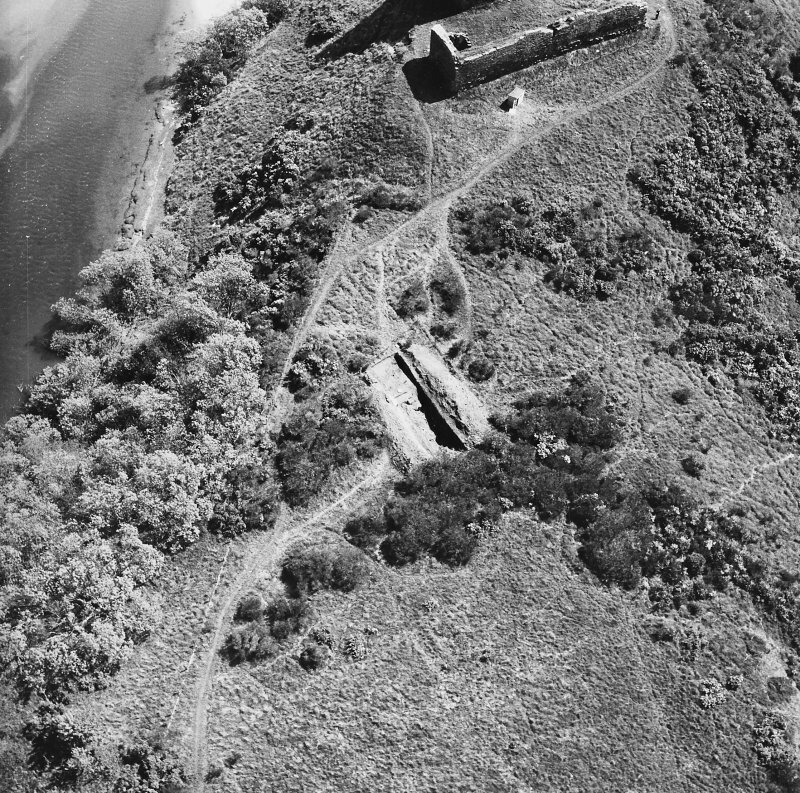 Oblique aerial view of Red Castle, taken from the SE. 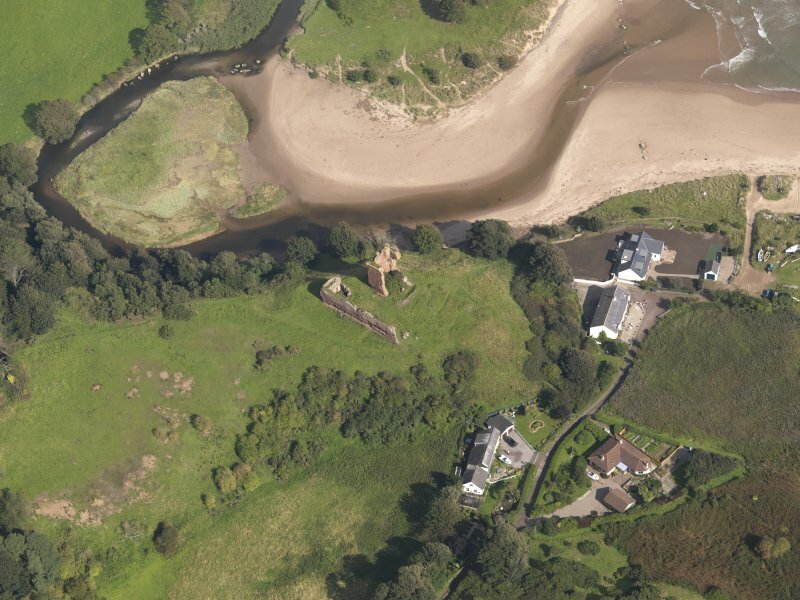 Oblique aerial view of Red Castle, taken from the SSE. 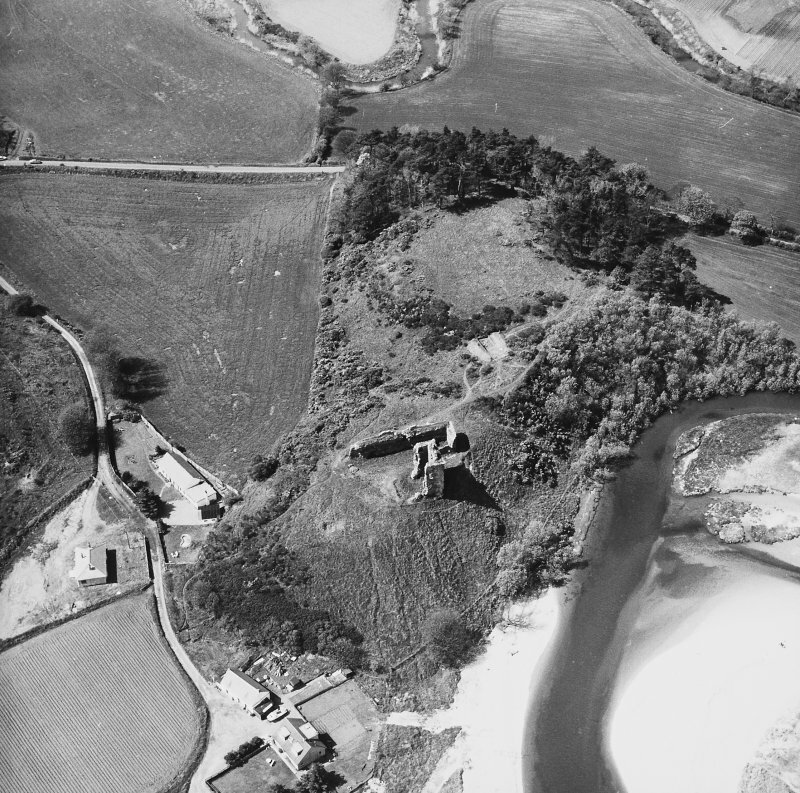 Oblique aerial view of Red Castle, taken from the SW.
Oblique aerial view of Red Castle, taken from the NW. 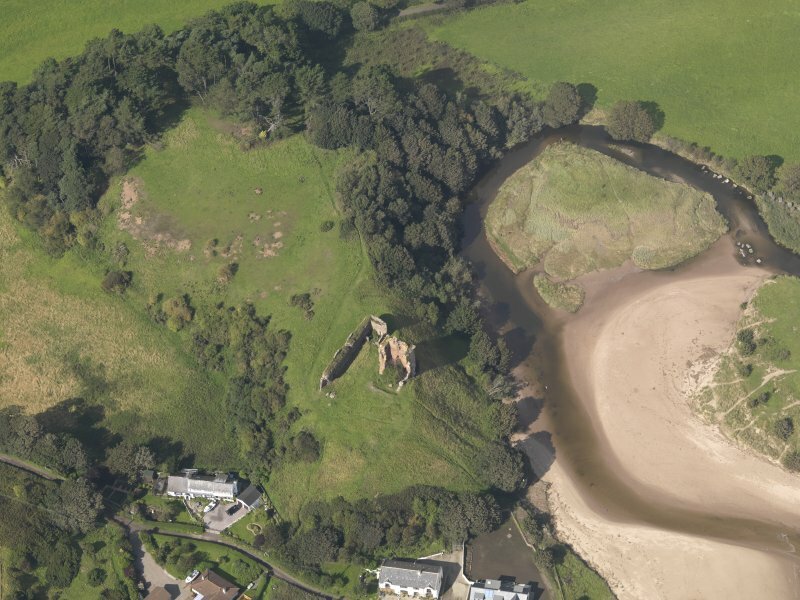 Oblique aerial view centred on the remains of Red Castle, Lunan, looking to the NNW. 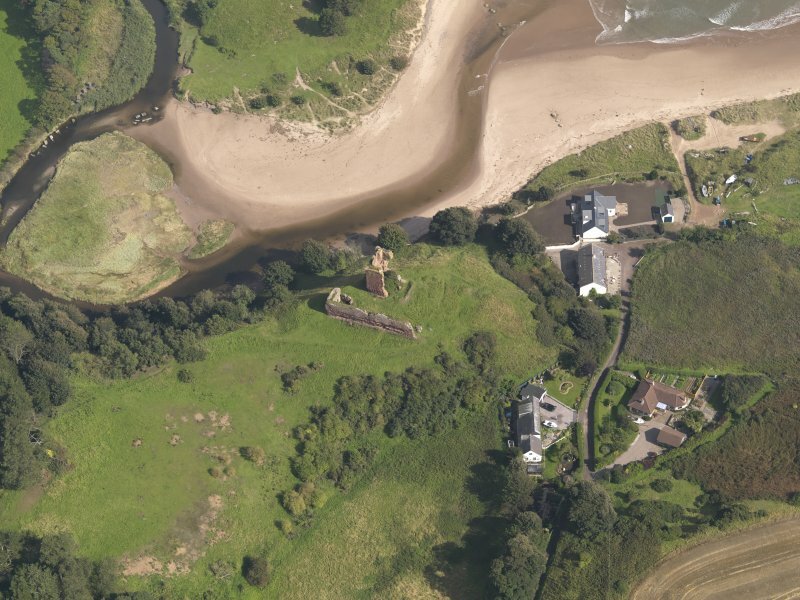 Oblique aerial view centred on the remains of Red Castle, Lunan, looking to the WNW. 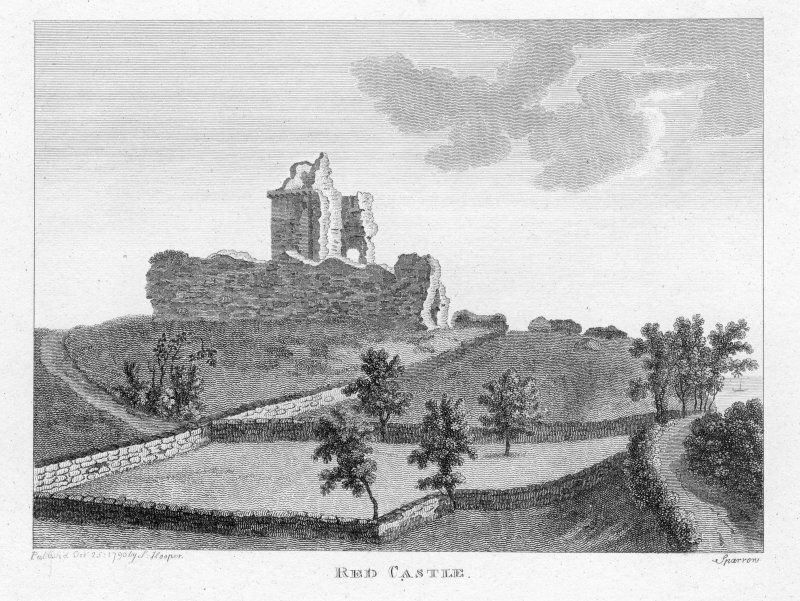 Redcastle, situated on a promontory and isolated by a ditch, was founded as a hunting seat by William the Lion (1165-1214) was besieged in 1579 and was ruinous although still partly roofed in 1770. The remains now consist of a possibly 13th century fragment of the massive wall of enceinte and the ruin of the 15th century rectangular tower. The name comes from the red freestone ashlar of which it is constructed. The remains of Red Castle are in a crumbling condition and very weathered. The enceinte wall is 6m high and 2m thick. 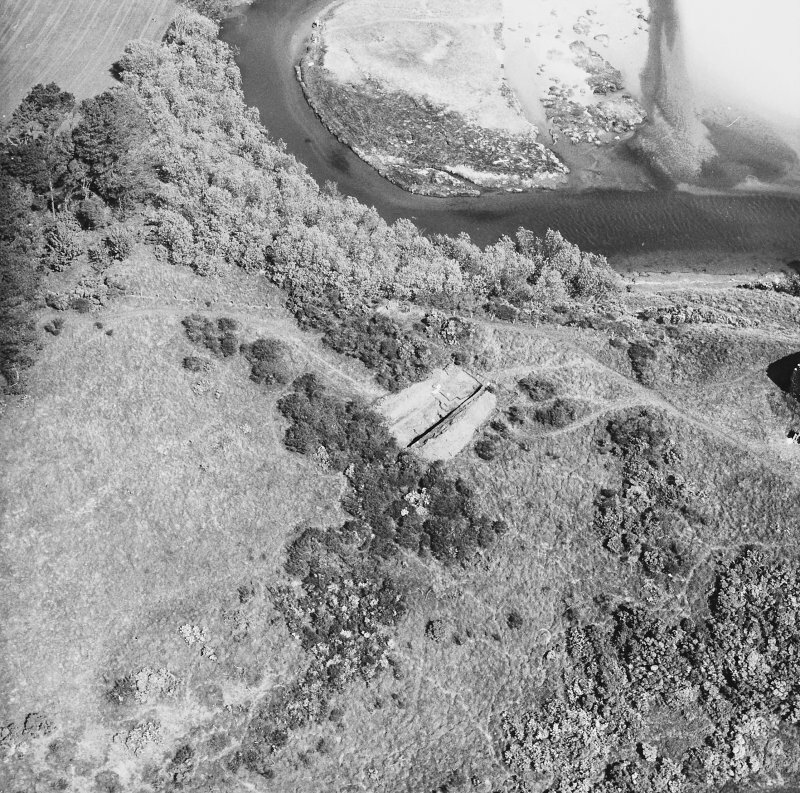 A fragment can be traced just below ground level on the edge of the escarpment at the NE angle of the keep. 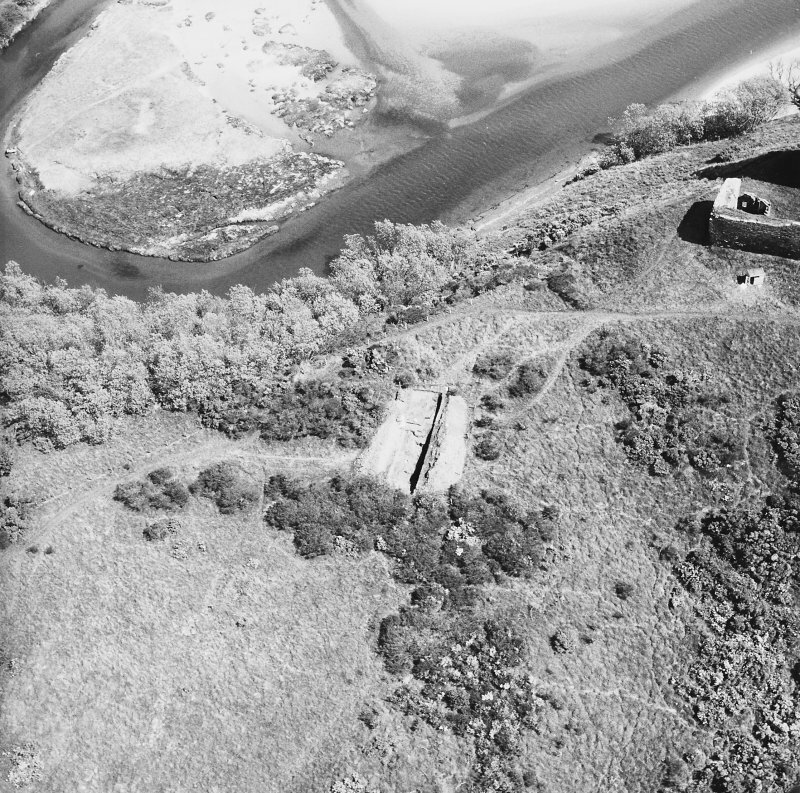 Of the keep, the N wall and the returns of the E and W walls stand at or near their original height and are 1.7m thick. The S part of the keep is fragmentary, 1.2m high and grass-covered. The remains of a building in the N angle of the enceinte wall are modern. A slight indentation, 2.0m deep, in the natural slope c.10.0m NW of the curtain wall may represent the E end of the ditch but otherwise there is no trace of it. 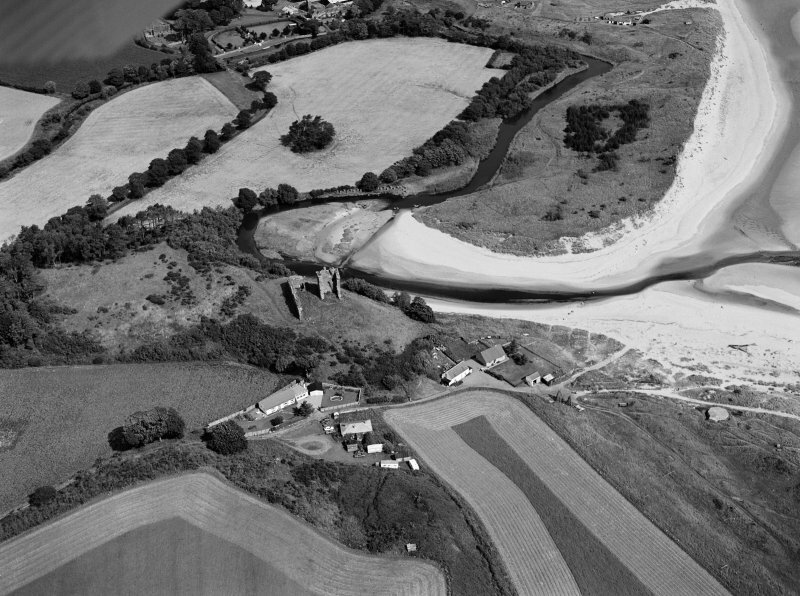 Contour, auger and resistivity surveying of the knoll around the castle produced indications of two ditches, one running straight to cut the knoll in two, the other running concentric to, and just outside the 13th century upstanding curtain wall, with a narrow causeway. A narrow (but deep) excavation across the linear ditch uncovered an original medieval (12th/13th century) ditch with dump rampart cutting and sealing ploughsoil which in turn truncated a collection of scoops and postholes related to early medieval/dark ages occupation. A Gibson and D Pollock 1983. 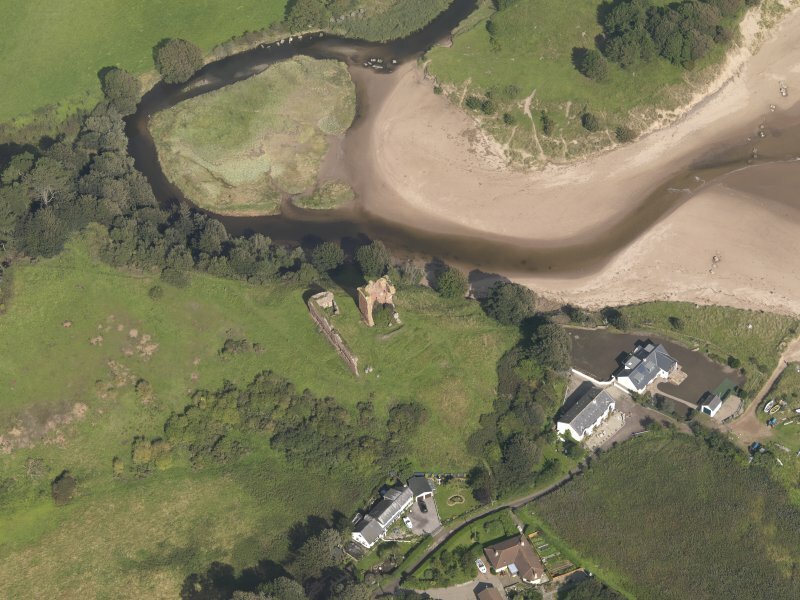 Re-examination of the continually eroding kitchen midden below Red Castle, resulted in the recording in situ of numerous shell species as well as post-medieval pottery, bone, baked clay and roofing tiles; in Montrose Museum. 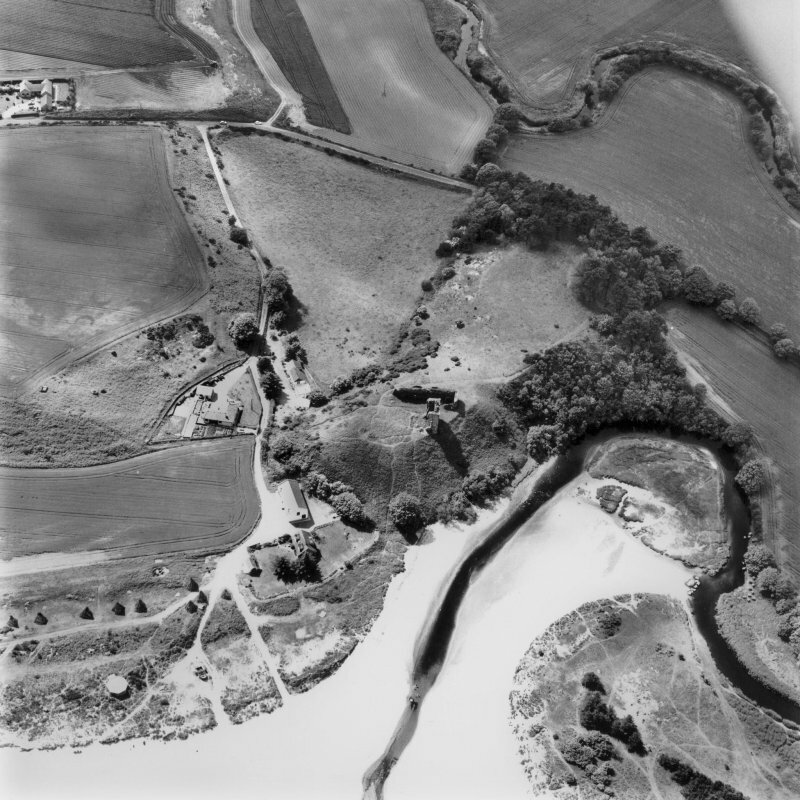 Air photographs: AAS/97/11/G22/24, 25 and 28; AAS/97/11/CT. This tower is in imminent danger of collapse, since the NE corner, which is the most complete part, has become undermined by land slippage. The foundation layer of grey-coloured broken rubble is exposed on this side. The lower of the two remaining windows on the E side has also collapsed, leaving the upper as a dangerous overhang. Information from I Edwards to RCAHMS, 10 February 1999. Brief descriptions of small houses in the barony of Redcastle.